Donatism (Latin: Donatismus, Greek: Δονατισμός Donatismós) was a Christian sect within the Roman province of Africa that flourished in the fourth and fifth centuries among Berber Christians. 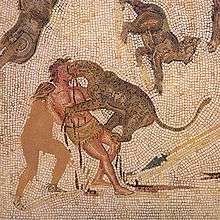 Donatism had its roots in the social pressures among the long-established Christian community of Roman North Africa (present-day Berber countries Algeria and Tunisia), during the persecutions of Christians under Diocletian. The Donatists (named for the Berber Christian bishop Donatus Magnus) were members of an offshoot church which did not follow the same doctrine as some other churches of the rest of Early Christianity in Late Antiquity. Donatism was an indirect outcome of Diocletian's persecutions. The governor of Africa had been lenient towards the large Christian minority under his rule during the persecutions. He was satisfied when Christians handed over their Scriptures as a token repudiation of their faith. Some Christians acceded to this convenient action. When the persecutions came to an end, however, they were branded traditores, "those who handed (the holy things) over" by their critics, mostly from the poorer classes. Like the Novatianist movement of the previous century, the Donatists were rigorists, holding that the church must be a church of "saints", not "sinners", and that sacraments, such as baptism, administered by traditores were invalid. Probably in 311, a new bishop of Carthage, Caecilian, was consecrated by someone who had allegedly been a traditor, Felix of Aptungi; his opponents consecrated a short-lived rival, who was succeeded by Donatus, after whom the schism was named. In 313, a commission appointed by Pope Miltiades fought against the Donatists, but they continued to exist, viewing themselves, and not the other Christians, as the "true Church", the only one with "valid sacraments". Because of their association with the Circumcellions, they brought upon themselves repression by the imperial authorities, but they drew upon African regional sentiment, while their opponents had the support of Rome. They were still a force at the time of Saint Augustine of Hippo at the end of the fourth century, and disappeared only after the Muslim conquest of the 7th–8th century. The primary disagreement between Donatists and the rest of the early Christian Church was over the treatment of those who renounced their faith during the persecution under the Roman emperor Diocletian (303-305), a disagreement that had implications both for the Church's understanding of the Sacrament of Penance and of the other sacraments in general. The rest of the Church was far more forgiving of these people than the Donatists. The Donatists refused to accept the sacraments and spiritual authority of the priests and bishops who had fallen away from the faith during the persecution. During the persecution some Church leaders had gone so far as to turn Christians over to Roman authorities and had handed over religious texts to authorities to be publicly burned. These people were called traditores ("people who had handed over"). These traditors had returned to positions of authority under Constantine I, and the Donatists proclaimed that any sacraments celebrated by these priests and bishops were invalid. The first question, therefore, was whether the Sacrament of Penance can effect a reconciliation whereby the apostate, or in some cases specifically the traditor, may be returned to full communion. The orthodox Catholic position was that the sacrament was for precisely such cases, though at the time the Church still followed the discipline of public penance whereby a penitent for such a grievous offence would spend years, even decades, first outside the doors of the church begging for the prayers of those entering, then kneeling inside the church building during services, then standing with the congregation,and finally receiving the Eucharist again in a long progress toward full reconciliation. The Donatists held that such a crime, after the forgiveness of baptism, disqualified one for leadership in the Church, a position of extreme rigorism. The second question was the validity of sacraments celebrated by priests and bishops who had been apostates under the persecution. The Donatists held that all such sacraments were invalid; by their sinful act, such clerics had rendered themselves incapable of celebrating valid sacraments. This is known as ex opere operantis, Latin for from the work of the one doing the working, that is, that the validity of the sacrament depends upon the worthiness and holiness of the minister confecting. 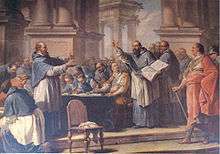 The Catholic position, according to Augustine, was ex opere operato from the work having been worked; in other words, that the validity of the sacrament depends upon the holiness of God, the minister being a mere instrument of God's work, so that any priest or bishop, even one in a state of mortal sin, who speaks the formula of the sacrament with valid matter and the intent of causing the sacrament to occur acts validly. Hence, to the Donatists, a priest who had been an apostate but who repented could speak the words of consecration forever, but he could no longer confect the Eucharist. To Catholics, a person who received the Eucharist from the hands of even an unrepentant sinning priest still received Christ's Body and Blood, their own sacramental life being undamaged by the priest's faults. As a result, many towns were divided between Donatist and non-Donatist congregations. The sect had particularly developed and grown in northern Africa. There was growing unrest and threats of riots in Carthage connected to the bishop controversy. [lower-alpha 1] Constantine, hoping to defuse the unrest, gifted monies to the "catholic" bishop Caecilian as payment for church buildings that had been damaged or confiscated during the prior period of persecution. No gifts were made to the Donatists (it appeared that Constantine was not fully aware of the seriousness of the dispute, thus his gifts only made matters worse). The Donatists appealed to Rome for equal treatment; Constantine tasked Miltiades to sort the issue which led to the 313 commission mentioned above. The Donatists refused to abide by the decision of the Roman Council and demanded a local council to hear the dispute. This attempt failed to produce a good hearing and the Donatists appealed directly to the Emperor. From his letter that survives, Constantine shows frustration that the church cannot come to a good conclusion and he calls for a larger council, what is now known as the Council of Arles in 314. Again, the decision went against the Donatists and again they appealed to Constantine. The Emperor demanded that all parties be brought to Rome for a hearing; Constantine ruled in favor of Caecilian and warned against unrest. A delegation from Rome traveled to Carthage to seek a compromise – this trip failed miserably. Donatist extremists were stirring up protests and violence in the streets. The Donatists refused to accept any compromise or decision in favor of the "catholic" bishop. After the Constantinian shift, when other Christians accepted the emperor as a leader in the Church, the Donatists continued to see the emperor as the devil. After several attempts to bring reconciliation, in 317 Constantine issued a severe edict that threatened the death penalty to anyone who disturbed the peace of the empire. Another edict followed that called for the confiscation of all Donatist church property. In Carthage Donatus refused to surrender buildings and the local Roman governor called for a "police" action, sending troops in to deal with the Donatists. The historical records are unclear, but it appears that some Donatists were killed and clergy were sent into exile. Outside of Carthage, however, Donatist churches were left undisturbed and the clergy were allowed to remain in place. Ultimately Constantine's efforts to bring unity between the "catholics" and the Donatists failed, and by 321 Constantine granted toleration to the Donatists. In an open letter to the "catholics" Constantine asked the bishops to show moderation and patience to the Donatists. More laws against the Donatists were issued by Valentinian I, after the defeat of the Donatist usurper Firmus in Northern Africa. The Donatists also drew their beliefs from the writings of Tertullian and Cyprian . St. Augustine of Hippo campaigned against this unorthodox belief throughout his tenure as Bishop of Hippo, and through his efforts the orthodox Catholic Church gained the upper hand. Augustine's view, which was also the majority view within the Church, was that it was the office of priest, not the personal character of the incumbent, that gave validity to the celebration of the sacraments. Augustine was convinced that men needed firm handling. He summed up this attitude in one word: disciplina. For him this was an active process of coercive punishment, a teaching by inconveniences – a per molestias eruditio. He based his view on the Old Testament – where it is described how God had taught his wayward Chosen People by checking and punishing their evil tendencies by a whole series of divinely-ordained disasters.In 409, Marcellinus of Carthage, Emperor Honorius's secretary of state, decreed the Donatists heretical and demanded that they give up their churches. This was made possible after a collatio, in which St. Augustine, with legal documents, proved that Emperor Constantine had chosen the Catholic Church over the Donatists as the official church of the empire. As a result, the Donatists were harshly persecuted by the Roman authorities, and even Augustine protested at their treatment. Nevertheless, the effects of Augustine's theological successes and the emperor's legal action were somewhat reversed when the Vandals conquered North Africa. It is also possible that the gradual decline of Donatism was due to the disappearance of the system within which it was identified as such no longer under imperial authority, Donatists and Catholics were equally marginalised by the Arian Vandals.Donatism survived the Vandal occupation and the Byzantine reconquest under Justinian I. It is unknown how long Donatist belief persisted but some Christian historians believe the Donatist schism and the discord it caused in the Christian community made easier the Muslim conquest of the region in the 7th century. Donatists followed a succession of bishops. John Wycliffe taught that the moral corruption of priests invalidated their offices and sacraments, which was the same belief that had originally characterized Donatism. The later reformers partially distanced themselves from Wycliffe's view of the sacraments precisely because of its Donatistic undertones. The Bezpopovtsy (priestless) stream of the Old Believers claimed that, because the Russian bishops acquiesced to Patriarch Nikon's reforms, they had forfeited any claim to apostolic succession, along with the other patriarchs. During and after the Reformation, the word Donatist (sometimes "neo-Donatist") was commonly used by the magisterial reformers as an incriminating label for the more radical reformers such as the Anabaptists. Conservative Lutherans are sometimes labeled Donatists by liberal Lutherans, as a reference to their doctrine of church-fellowship and position that churches which deny that Jesus’ true Body and true Blood are eaten during the Eucharist do not celebrate a valid Lord's Supper. Within the Catholic Church, the breakaway group the Society of St. Pius X is sometimes accused of having a Donatist mentality. ↑ The remainder of this paragraph comes from Frend 1952 text which continues as an authority text. Frend gets his chronology of events mainly from the work of Optatus, "Against the Donatists," a biased presentation, but one of the only surviving ancient sources for these events. ↑ Cantor 1995, pp. 51f. ↑ Cantor 1995, p. 51. ↑ Cross, FL, ed. (2005), "Novatianism", The Oxford dictionary of the Christian church, New York: Oxford University Press . ↑ Cross, FL, ed. (2005), "Donatism", The Oxford dictionary of the Christian church, New York: Oxford University Press . 1 2 Frend 1952, pp. 144 45. ↑ Frend 1952, p. 156. ↑ Frend 1952, p. 157. ↑ Frend 1952, pp. 159 60. ↑ Frend 1952, pp. 161 62; from the Letters of Constantine preserved by Optatus. ↑ Augustine, Aurelius, "2", Letter (134) . ↑ Mitchell, Stephen (2007). A History of the Later Roman Empire. Blackwell. p. 282. ↑ "Donatism", Concordia Cyclopedia, CMU . ↑ Herring, George (2006), Introduction To The History of Christianity, New York: New York University Press, p. 230 . ↑ Pelikan, Jaroslav (2003), Credo: Historical and Theological Guide to Creeds and Confessions of Faith in the Christian Tradition, Yale University Press, p. 474 . ↑ Verduin, Leonard. "1". The Reformers and Their Stepchildren. ISBN 0-8028-3791-3. ↑ The doctrine of church fellowship, Reclaiming Walther . ↑ Metzger, Paul W, What Constitutes A Valid Celebration Of The Lord’s Supper? (PDF), WLS essays . ↑ "A Case Study In Modern-Day Donatism". matt1618.freeyellow.com. Retrieved 2016-03-28. Cameron, Michael (2001), "Augustine's Use of the Song of Songs Against the Donatists", in van Fleteren, Frederick, Augustine: Biblical Exegete, New York: Peter Lang . Russell, Frederick H. (1999), "Persuading the Donatists: Augustine's Coercion by Words", in Klingshirn, William E, Limits of Ancient Christianity: Essays on Late Antique Thought and Culture in Honor of R. A. Markus, Ann Arbor: University of Michigan Press .